Most people have never heard of David Dodd Hand who became Walt Disney's right hand man. He began his career as the 4th animator hired at Walt Disney's Hyperion studio and later became the supervising director on Snow White. He worked on 14 different feature films and even met the Queen "Mum" after he established an animation industry in English after working for Disney. In the new book, Animation Pioneer, David Dodd Hand, his son helps tell the story of his father's animated career and life. 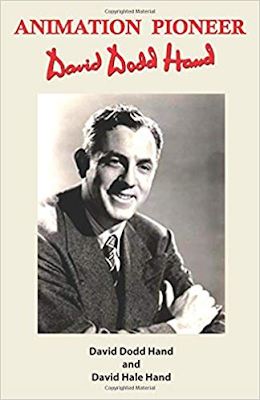 Its a fascinating autobiography, full of animation history and is a must for anyone interested in learning animation history. If you tune into WU Radio link at 10pm PDT from Tuesday 10/16 to Monday 10/22, you will hear a few of those stories from an interview with David Hale Hand about the book. You can also listen and subscribe to the Animateducated YouTube channel.